To get your product and services to stand out, especially in a crowded market, you either have to do different activities, or you have to do the same activities in a different way. Increasingly, companies are using remarkable customer experiences as that point of differentiation. It makes smart business sense to do so. Whenever I come across a business that delivers noteworthy customer experiences, I can’t shut up about them. That’s what happened when I discovered a 24-hour cupcake ATM, a NYC-subway were it didn’t belong, and a fun pop-up store that used magical superpowers to get me to see myself as a runner. And now, because of the customer experience a perfume boutique provides I’ve officially moved it up on my top ten list of things to do in the city when people come visit me. That’s what my father said after buying my mother a bottle of perfume in Fueguia 1833, a brand of perfume with physical stores here in Buenos Aires, New York, Milan, Zurich, and Tokyo. A few months ago when I learned my parents were going to come visit me in Buenos Aires, I got to work making a list of things for us to do and attractions to see. A friend and I had stumbled into the store a few years ago and I knew my mother would love the boutique because she’s into perfume. Heck, I love the boutique, and I don’t even wear perfume. Well, at least I didn’t before my trip to Fueguia 1833 with my parents. It is like no other perfume store we’ve encountered. 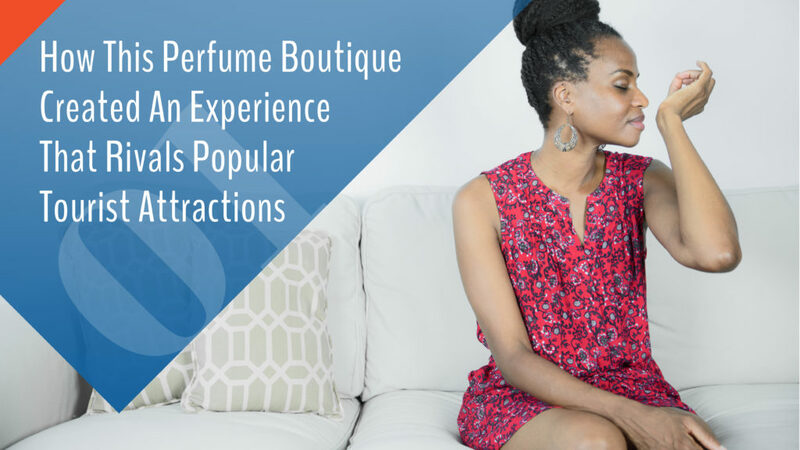 Here are two lessons you can take from this unique perfume boutique, to help you deliver remarkable customer experiences that grow your business. 1. Unexpected customer experiences attracts your ideal customers to you like a magnet. Like my father, I always associated perfume shopping with walking through a department store in the mall, with clerks spraying fragrances on white cards trying to get you to take them as you passed by. That’s why the traditional perfume store model never worked on me. If I wasn’t already in the mood to buy perfume, which 99.5 percent of the time wasn’t the case, then there was no need to give any thought to a new fragrance. But customer experiences are attraction marketing at its finest. Aside from smart content marketing, most methods businesses use to grab their customers’ attention are annoyances customers work to thwart every chance they get. But the decor at Fueguia 1833 draws you in from the street with its noteworthiness. The opulent window display, the glimpse of the “perfume table” from the adjacent sidewalk, and the sign that read “perfume laboratory” compelled my friend and I to go inside to explore further. And once you step in, the black curtains that line the wall focus your attention on the majestic center table that is lined with all the fragrances in beautiful bottles that sit atop wooden boxes. The store oozed sophistication. And just being inside of it made us feelmore sophisticated. And because of that feeling, we developed a burning desire to check out the fragrances. Delivering out of the ordinary experiences that are delightful, will help you win more customers, including the ones who would have previously ignored you. 2. Engaging in a product trial should be a fun experience. There’s no way I’d walk to a perfume counter in the mall and then proceed to smell every fragrance. Not. gonna. happen. But that’s exactly what I did in this boutique. The setup and decor was designed in a way that made sampling the products fun. Instead of spraying perfume in the air or on yourself to get a good whiff, you lift up a glass vial to inhale a fragrance. And when you need to “cleanse your nose” from scent overload, there’s a vial of coffee beans for you to smell, so you can get back to it. We had such a good time being sophisticated perfume connoisseurs, we snapped photos of each other waving the perfume vials under our noses. As a result of the time spent sampling all the options, I found a fragrance I adore. When I got home from the store later, I couldn’t stop smelling my arm, because I loved the scent so much. And as soon as I run out of the sample I got from the boutique, I’ll be back to purchase a bigger bottle. You don’t have to offer product trials the same way everyone else in your industry does. Look for ways to make sampling what you’ve got a memorable event. Remarkable experiences win customers. And they make the selling process go more smoothly. The time is now to start delivering them. Consistently.